Tom Lorraine knows AFC Rushden & Diamonds have a difficult challenge in front of them when they head to Deeping Rangers in the second qualifying round of the FA Cup on Saturday. Diamonds will be taking on a side they know fairly well having gone up against Deeping in the ChromaSport & Trophies United Counties League Premier Division before they were promoted at the end of last season. 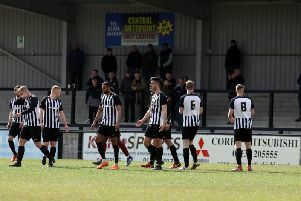 Since stepping up, Andy Peaks’ men have flourished and they continued their unbeaten start to the new campaign by maintaining their lofty position in the Evo-Stik Southern League Division One Central table with a 1-0 victory over Aylesbury last weekend. Lorraine grabbed the winner in that game but now Diamonds are turning their attention back to the FA Cup as they bid to make it into Monday’s third qualifying round draw. Most will fancy them to get the job done against a team from a lower level. But, after Deeping’s exploits in the last round when they beat Evo-Stik Northern League Division One South side Leek Town, striker Lorraine is taking nothing for granted. “We were delighted to get the win at Bedfont in the last round,” Lorraine said. “I don’t know whether the draw has been favourable to us or not to be honest. “They (Deeping) are a team from a lower league but they have beaten Leek in the last round and they are from the same level as us. “So it is going to be a challenge for us going to their ground. “They will have a crowd there who will be on our backs but I am sure we will take a few with us as well. “It’s the FA Cup and I think everyone gets excited by it. Diamonds’ victory over Aylesbury, which left them sitting in second place in Division One Central on goals scored behind leaders Chalfont St Peter, extended their unbeaten run to 30 competitive matches. And Lorraine admitted confidence is high within the dressing-room. “Football is a game of habit and when you are in the groove of not losing matches it stays with you,” he added. “But the same goes for when you lose a couple, that can also become a habit. Diamonds’ Division One Central game with Fleet Town, which was postponed due to their continued FA Cup commitments, has been re-arranged and will be played at the Dog & Duck on Tuesday, October 20 (7.45pm).